Bad news for those of you who currently emit a sweet, slightly musky, vanilla fragrance, with slight overtones of cherry, combined with the smell of a salted, wheat-based dough. You need to stop doing that immediately, because that particular smell has just been trademarked by the Hasbro Corporation. Actually, it’s probably fine if you smell that way because you’ve recently been handling Play-Doh. If you haven’t, you probably need to go see a specialist, like, immediately. Why so few trademarks, when there are so many smells? Well, it isn’t easy to trademark a smell, and the concept itself is a little controversial. The main problem seems to be the requirement that a trademarked feature be “nonfunctional,” designed to keep trademarks from limiting competition too much and probably also to keep them from overlapping with patents. This, ironically, means that the smell of a perfume cannot be trademarked, because the PTO considers that to be its function. 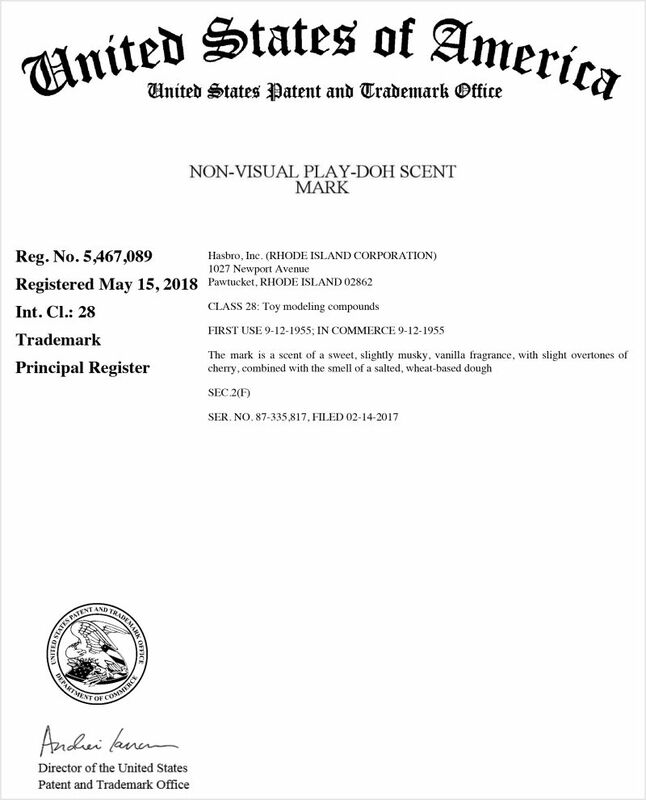 It is possible to patent a scent molecule, as we have discussed here before. See “‘Pretty Sure Stank Is Patented,’ Lawyer Claims—But It’s Complicated,” Lowering the Bar (Oct. 18, 2017). But that too is rare. It has, however, become “distinctive” over the past half-century or so, and it is now a trademark on the Principal Register. I did uncover one disturbing discrepancy in the company’s claims about this product. On its “Fun Facts” page, Hasbro says that “if you made a big ball of all the Play-Doh Compound ever created, it would weigh more than 700 million pounds.” But according to the very same page, the company has made “over 950 million pounds” of Play-Doh since 1956. So either there is reason to question the reliability of Fun Facts, or a quarter-billion pounds of Play-Doh has gone missing over the years. If so, where is it? I don’t think kids could have eaten that much, although I could be wrong. Have people been dropping it into the ocean, and that’s what’s causing sea levels to rise?